It is my sad duty to inform you of the passing of Dr. Ismail A.S. Elkholy on November 4, 2013 in Richmond, B.C., Canada of terminal thymic cancer. He was 67. He is survived by his wife of 25 years, Gloria Lauris, and his 20 year old son, Alexander (Ali). The second of 7 children, Ismail was predeceased by his parents, two brothers (Youssef and Hussain) and one sister (Soheir). Three sisters (Magda, Aida and Madeha) are still alive in Egypt, as well as all their extended families. Dr. Elkholy had an extensive career spanning over three decades with diverse experience in senior/executive management in Engineering, Construction and Transportation industries with crown agency, private companies and the public sector. Born in Shebin El Qanater, Qalubia, Egypt, Ismail received the Ideal Student Award from his province of Egypt at high school graduation. He went on to study in Cairo, receiving his B.Eng in Civil Engineering (Structures) from Cairo University. Earning a scholarship to come to Canada, he studied at McMaster University, earning his M.A and Ph.D in Civil Engineering & Engineering Mechanics. Additionally, he eventually completed his Masters Certificate in Project Management from Winnipeg and York Universities, as well as an MBA from McGill. In addition to his professional working life, Ismail was also an accomplished ballroom dancer and won several trophies at an earlier age. He also grew fruit trees, vegetables and exhibited roses in Ontario. He modeled briefly in Alberta. He used to play tennis and golf, and he watched soccer (known as football overseas) occasionally. He was a likeable person who enjoyed people and he was often sought out for his council and negotiation skills. Ismail travelled frequently, lived in many places and was a true global citizen. He generally was an easy-going person but had a drive to excel at whatever task he took on or was given. Ismail will be buried in his home-town cemetery in Shebin El Qanater, Egypt this month. 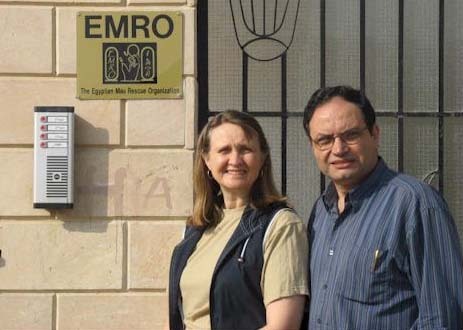 1) EMRO, the Egyptian Mau Rescue Organization (www.emaurescue.org) was co-Founded by Ismail and his wife in 2005 as an Egyptian charity (NGO #6196) to help local, ancient street cats (Maus) through (international) adoption/rehoming and education. Additionally, a veterinary clinic was established at the shelter to provide service to pets at reduced and competitive prices, and to encourage humane treatment of all animals in general. It also provides employment for local professionals. We hope to name a room after Dr. Elkholy at the shelter charity in recognition of his efforts. For donations to the EMRO initiative, please contact EMROSponsor@emaurescue.org and mention his name. 2) Through helping create an ongoing educational scholarship fund for deserving students in Ismail's local home town of Shebin, where he originally began, in an effort to help other talented Egyptian students who may otherwise not have the means to go further in their studies. For more details, please contact Info@emaurescue.org. Ismail is, and will be, greatly missed. TAZO, the EMRO "Cat Founder" - R.I.P. 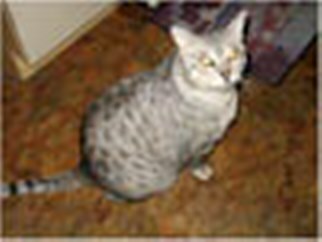 Tazo, the silver Egyptian Mau adopted in Canada by the EMRO Founders, and who prompted the founding of the EMRO Shelter in Cairo, Egypt, passed away during the last two weeks of April 2014 of chronic Pancreatitis. He was 14 years old. After the Founders adopted him, they went about seeking a companion for him. 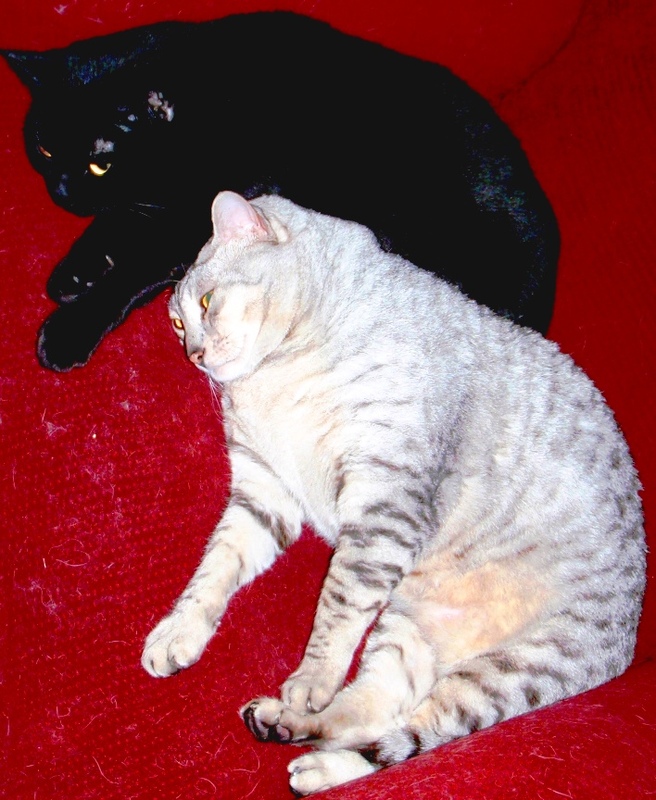 However, when they were unable to locate another Egyptian Mau, and saw just how poorly Egyptian Maus were treated in Egypt, they founded the EMRO Shelter. Tazo resided in Burnaby, B.C., Canada in his second adopted home for 8-9 years, living the good life with his loving Guardians and his buddy, Bailey (see pictures below). Although he was on a special diet for many years, the chronic Pancreatitis took its toll, and he faded quickly. All of us at EMRO, as well as Friend's and Volunteers, are saddened by this kitty's passing. However, we are joyful that the love and caring of one little cat established a place to provide shelter, medical treatment, and to make Life better for cats in Cairo, as well as to preserve the famous Egyptian Mau. We celebrate what the love of a single animal can do to help drive a person to create a new place where Life can be improved for so many. Thank you, Tazo, and Thank You Founders/Volunteers/ Friends of EMRO for helping us remember and celebrate an event which makes this world a better place for both people and animals. Below: Tazo after first being adopted; Tazo and buddy, Bailey, shortly before Tazo's passing in April 2014.